Suitable for Android phone with OTG function,such as Samsung Galaxy S6/S6E( ),S5 only,S4 only,Note 5,4,3,2,Note Edge,LG G4/3/2/1, G Pro 1,etc. 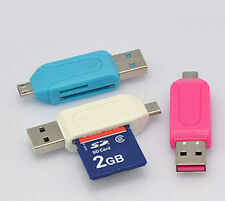 Interface:USB2.0, Micro USB for Android phone, 1 SD/MMC slot, 1 Micro SD/TF slot. The item is standard version, it compatible any device. Order Notice ~. Goods ensure the highest quality possible. We will try to respond as quickly as possible. New TF card back SD SD cards / TF adapter. 1 TF SD card case (excluding TF card). Hereinafter referred to as: TF SD card set. Type of card: TF card. USB interface : micro usb / usb. A transmission interface. USB2.0 (micro USB 5pin) USB A Male. USB A male with a micro USB dual- plug design, Smart Phone and PC support dual interface. Support : SD card / micro SD card. With the Micro USB OTG Card Reader, can transfer files from your phone, tablet or computer to another phone, tablet or computer. What is OTG?. Interface: Micro USB and USB 2.0 Connectors, support PC and smart phone that with OTG function. This OTG card reader supports phone or tablet with type-c port. This card reader can read MicroSD/TF card. (card is not included). 1 x USB 3.1 Type-C Card Reader. Item Type: Card Reader. Card Compatibility: MICRO SD/SDXC/TF card (card is not included). Suitable for the PC and smart phones/tablet with OTG function. - The micro usb port cable connected to OTG : Approx. - Support smartphone and tablet PC with OTG function and micro USB port. - USB interface: Micro usb / USB 2.0 / Compatible with standard USB 1.1/1.0. Lightning to Micro SD TF Card Reader USB Flash Driver Storage Expansion For iPhone 5/6/7/8/X iPad Mac iPod iTouch Name: USB Lightning Card Reader Interface: USB & Lightning Support: MicroSD, MicroSDHC, MicroSDXC (From 1GB to 1TB, FAT32 & exFAT) . This card reader supports SD/Micro SD card up to 512G. For the OTG connection, compatible with Samsung Galaxy or Note series phones and tablets, Google Nexus series, Dell, Motorala, Sony, Nokia, Lenovo yoga/ThinkPad, Acer tab, HTC and more. The USB OTG adapter by Delock can be plugged into a USB A male port. Therefor the USB A male will be converted into an OTG Micro-B connector. Questo portatile USB 3.0 di livello professionale. Porta di connessione: porta USB 3.0 x1, porta SD x 1, porta XQD x1. 1 x USB 3.0 3in1 XQD Card Reader. Slot per schede: All in 1 / Multi in 1. Interfaccia: USB. This Delock Card Reader Hub enables you to read and write memory cards via Micro USB OTG port of your smartphone or tablet. Speichererweiterung für iPhone / iPad. unbenutzt in OVP. KEINE MICRO SD KARTE ENTHALTEN ! 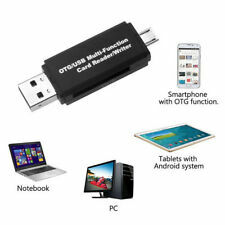 Support Android 2.3 or above smart phones and tablet with OTG function. Supports memory card capacity: Max 32G. Support memory card: SD Micro SD/T-Flash. Welcome To My Store. Ahora el intercambio de imágenes para teléfonos inteligentes, tabletas y PC es rápido y fácil!. Che cosa è OTG?. Supporta la Samsung Galaxy SII I9100, I9103, I9220, SIII 9300, Nota II 7100, HTC nuovo ONE, HTC farfalla, Sony Xperia Z, Xiaomi 2 e smart phone e tablet che supportano la funzione OTG e micro interfaccia USB. Ora, lo scambio di immagini per smartphone, tablet e PC è semplice e veloce!. Equipado con un cable 3 en 1 USB 3.0 que puede cambiar USB 3.0 o Micro-USB 2.0 o Type-C a Micro-USB 3.0. El estuche con un puerto Micro-USB 3.0, se puede utilizar como un lector de tarjetas para leer tarjetas TF / CF / SD. Compatible with SDHC devices with miniSD slot or SD slot(with miniSD adapter). 16GB 32G 64GB SDDD3 SanDisk Micro Flash Drive USB3.0 OTG M3.0 Ultra Dual 150MB/s. For MacBook Pro (2017, 2016 ) ;. USB Type C connector is the new design for USB 3.1. For Samsung galaxy S8/S8 /S9/S9 /S10/S10 /S10e/Note8/Note9. For LG G5 G6 V20. Multiple USB 3.1 interface support plug and play. 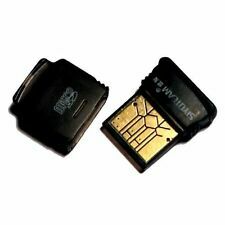 Compatible with: Support SDHC, SDXC, Micro SD, Micro SDHC (UHS-I), Micro SDXC (UHS-I) and CF Type I/MD/MMC. - Hi Speed: USB 3.0 Multi-in-1 Card Reader provides superior transfer performance. 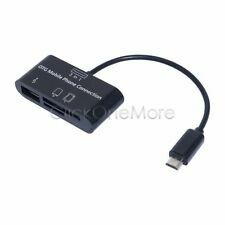 1 Piece Micro USB OTG Adapter. 1 wuxinji Dongle Zillion x Work Repairing Drawings（Random Color）. iphone (MainBoard Colored Diagram), ipad (MainBoard Colored Diagram), iphone Circuit Board with no chip (MainBoard Colored Diagram), ipad 3G version to wifi version (MainBoard Colored Diagram), Samsung (MainBoard Colored Diagram), Disassembling Screw Holes (MainBoard Colored Diagram), iphone Full series of CPU High-Definition Picture (MainBoard Colored Diagram), iphone Series (Layered DWG). Descriptions： Huawei's Nano Memory Cards are identical in size and shape to a Nano SIM card and are proprietary to Huawei Mobile devices. Easy to use and super-convenient, the NM Nano Memory Card Reader is a perfect accessory for your on-the-go digital life. USB 3.1 Gen 1 High-Speed Transmission Micro SD & NM Memory Cards Supported Speed (Max): 100 MB/s, Memory Card Storage (Max): 2 TB Type-A & Type C Dual USB Ports Packing include: 1*Card Reader（Memory Card not include） EAN 0765756431408 Brand Unbranded Compatible Brand For Huawei Compatible Model For Huawei Mate 20Pro/20X MPN Does Not Apply. Compatibility of Devices: All your devices. It has four interfaces: lighting connector for iOS devices; Micro USB connector for Android devices; USB connecto for computers/Macs; Type-C connector is for Type-C devices. MMC I / II / 4.0. SD / Micro SD / Mini SD . MS / Duo / Pro / Ultra II / Rom / Pro Duo . USB 2.0 specificazione, funziona in qualsiasi porta USB. Lettore USB ad alta velocità Lettore USB Micro scheda Mini 2.0 Slot singolo di qualità Compact Flash. Hi-speed USB 2.0 CF lettore di schede. 1 USB 2.0 CF lettore di schede. Funzione: lettore di schede Compact Flash. Mini and Micro SD are supported when used with an adapter to fit the slot (adapter not included). If your SD card doesn't have enough space to take more photos and videos, copy it from your SD card to your iPhone and iPad and your Android phone and tablet to free up space for a secure backup. USB Adapter UK Socket plug x 1. T HE ITEM INCLUDES INTERNATIONAL ORDERS. It is one-way transfer. On iPhone & iPad, select the photos and videos that you want to import. You can choose the photos you would like to import and find them in Last Import of your Albums. A5: Because of the limits from Apple, the Reader ONLY supports standard photo formats, including JPEG and RAW, along with SD and HD video formats, including H.264 and MPEG-4. This Delock Card Reader enables you to read and write memory cards via Micro USB OTG port of your smartphone or tablet. Furthermore you can use the card reader comfortably on your PC. Micro USB OTG Kartenleser: vollstaendige Unterstuetzung mit allen Mobilgeraeten, die OTG unterstuetzen.Kompatibel mit USB 2.0, SD, TF, MS und M2Bei Anbindung von Peripherien leuchtet LED permanent; Bei Anbindung des Verteilers an ein Mobilgeraets blt die LED regelmaessig; Einfache und uebersichtliche Anzeige des BetriebsstatusEine externe Stromversorgung ist notwendigDimension von 6 * 6.5 * 1 cmLieferumfang:1 x OTG Kartenleser USB Hub1 x Micro USB LadekabelHinweis: Wegen der Lichtstrahlung und Bildschirme koennte der Farbeton in den Fotos sowie des tatsaechlichen Produkts etwas unterschiedlich sein. Der erlaubte Messfehler ist /- 1-3 cm. Brand ohne Marke MPN Nicht zutreffend UPC 190268494144 EAN 190268494144 ISBN 190268494144 Her.